Since The Walking Golfer was launched, I have been asked on occasion why I decided to create the site and why I am passionate about encouraging others to walk when they golf. I have loved golf since I was a young boy, and as my parents can attest, I used to get excited every time I saw a golf course, such was my passion. I had opportunities growing up, while visiting family in Ireland over the summer, to travel into town and play Cavan Golf Club with the local kids. We would often play 36 or 54 holes a day, walking every step. Walking a round at Wolf Point in Gulf Coast, TX. Photo courtesy of Mike Nuzzo. I spent most of my youth in Toronto playing five to seven hour rounds at Don Valley Golf Course which is a muni. Although it took forever, my friends and I enjoyed every minute of it. After my father joined The Summit Golf Club, when I was in high school, the opportunity to play on a fantastic Stanley Thompson increased my appreciation of the game even more. However, to be honest, as an extremely competitive young man, I did not truly understand what golf is really about. I was obsessed with score, instead of just enjoying the walk. After college, I had about ten years away from the game because I did not have the time or the means to play. While I missed golfing, I did not miss the frustration that I used to heap upon myself when I did not play up to ridiculous expectations. With years come wisdom, and with the help of others, such as the discussion group at Golf Club Atlas.com and some wonderful books on golf course architecture, I began to appreciate the game for much more of what it is supposed to be – an enjoyable walk through nature. 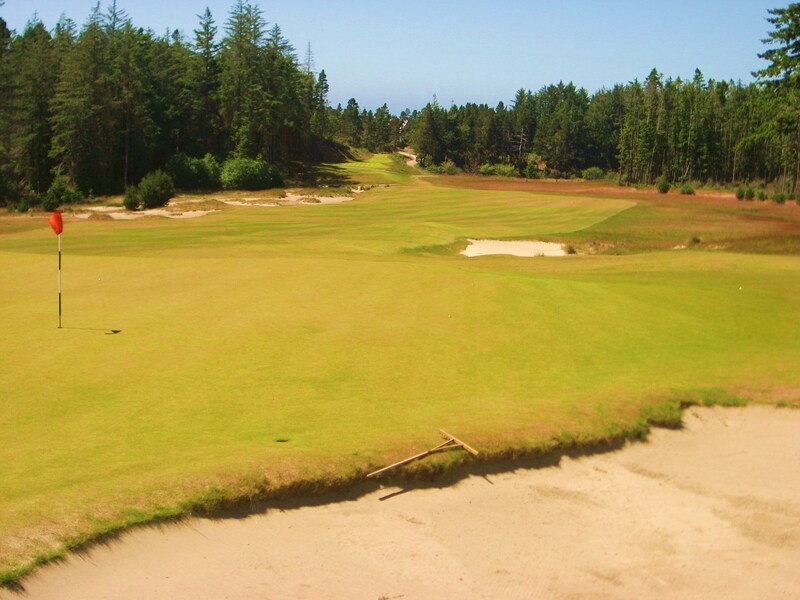 The Seventh at Bandon Trails. Ironically, as I took a step back and began to think less about my game, and more about the experience of walking the course, I began to play better. The misses became less significant, the pure strikes became much more enjoyable, and a match became much more interesting than playing for score. At the end of the season, my handicap was lower than it had ever been before and I was regularly shooting in the 70s. Simply – enjoying the walk. Whether I was playing an early morning round on my own, out for an afternoon match with friends, or racing the sunset to finish eighteen, I simply enjoyed being on the golf course more than ever before. There is a spiritual element to golf that exists in few other games. Standing on the first tee in the morning as the sun comes up over the horizon, the scent of freshly cut grass hanging in the air, as the light slowly unveils the beautiful landscape that will entertain you for the next few hours. Or standing on the eighteenth tee in the evening as the sun descends behind a tall stand of trees, the hills or into the ocean, when you are there alone and at one with nature, a flag waving in the distance. 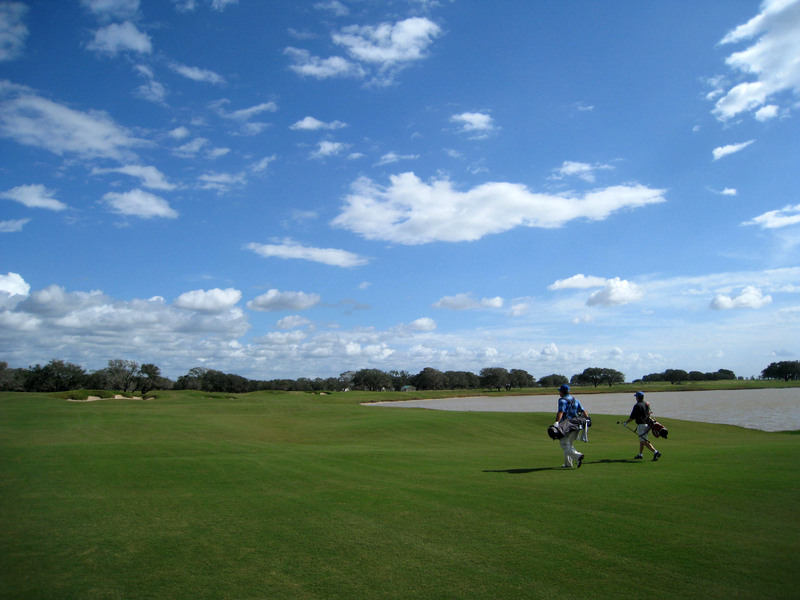 This is golf in its purest form; this is a walk to be enjoyed. 4th Tee at Pacific Dunes. At the end of the day what is the game about? Whether you want to step up to the first tee again and play another round. And what makes the game enjoyable? That pure shot you hit on the long par three. The amazing five iron you managed to hook “from jail” through the trees and run up on to the green. The forty foot putt you made to halve the hole. The four hours you spent with a friend who you had not seen in a year. The opportunity you had to play Ballybunion with your son before he went off to college. 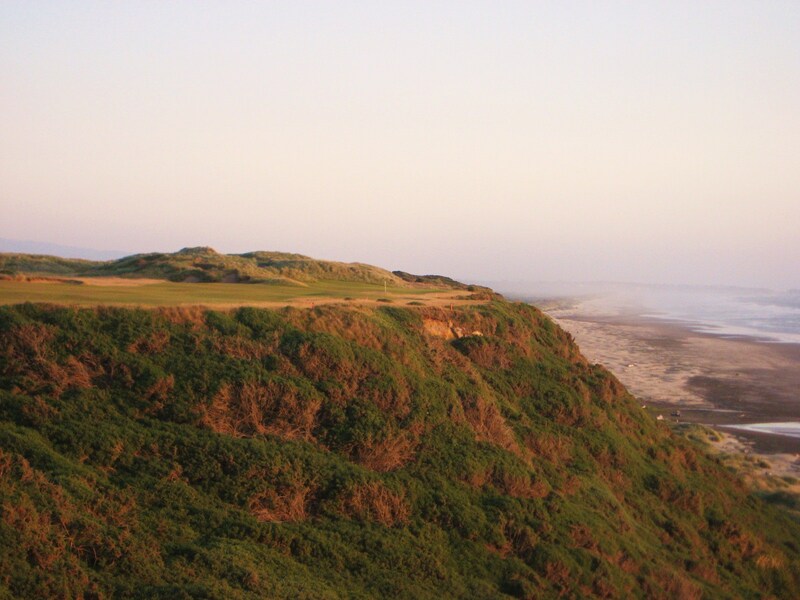 Experiencing Pacific Dunes with friends after years of thinking about “Dream Golf”. Feeling goose bumps on your neck as you walk up the home hole at St. Andrews on a fine summer day. Absorbing the truly amazing work of art that is a great golf course. 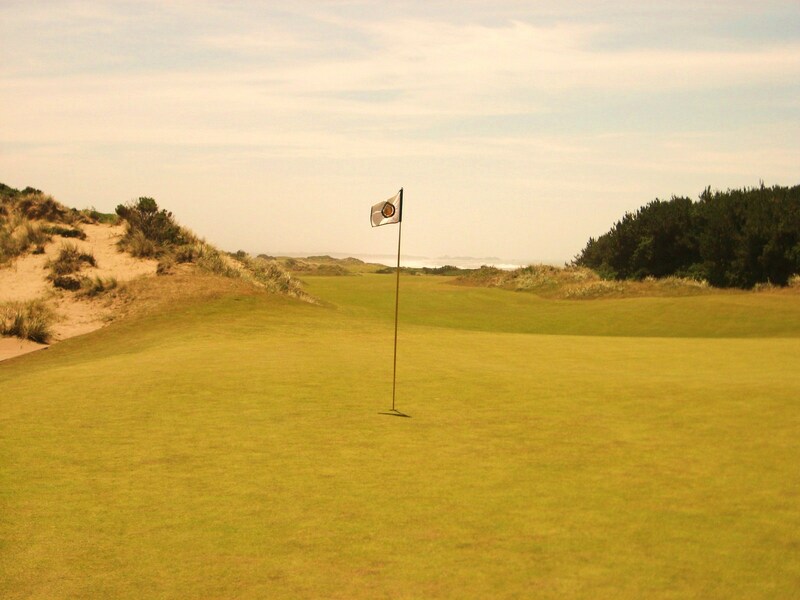 5th Green at Bandon Dunes. What makes the game unfulfilling? Focusing on score and expecting too much from yourself. Thinking of excuses for why you played badly before you even tee it up. Getting frustrated and clouding your mind with negative thoughts. So why did I create The Walking Golfer website? To create a community and a Society where walking golfers could come together and share their experiences and thoughts about why they enjoy walking when they play. Also, to provide a hub where golfers can seek out information about courses and product, along with the many benefits of walking when you golf, which only starts with fitness. 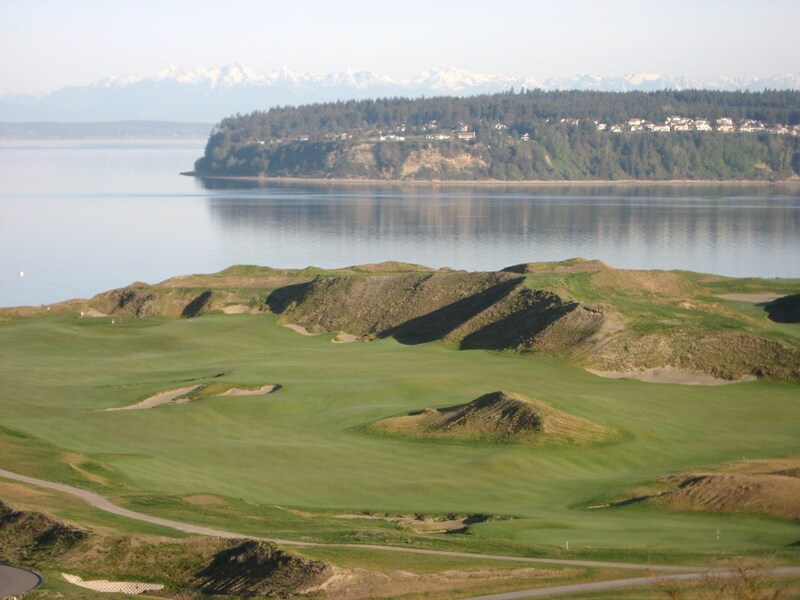 View of Chambers Bay, Puget Sound and the Olympic Mountains. Because I truly believe that it is the only way to play the game and enjoy everything that golf has to offer. A course cannot be fully appreciated from a cart path or while zipping over the fairway at 15 miles an hour. A conversation cannot be enjoyed with a group of friends when you are isolated in different carts. Feeling the ground through the soles of your shoes and being able to take in your surroundings is one of the most relaxing activities in the world, and that cannot be experienced while in a cart. The subtle nuances of design that the architect has carefully laid across the natural landscape cannot be fully appreciated while in a cart. Thoughtfully strategizing your approach shot to the green while walking from the tee to your ball is not something that can be done in a cart. Picking up your bag, slinging it over your shoulder and listening to the gentle “click, clack” of your clubs knocking together as you stride up the fairway is not something that can be experienced from a cart. Golf is a walking game for a reason, it is a walking game because it is not only about the few seconds you spend over the ball executing a drive, approach, recovery or putt, it is about the majority of the time spent in-between, when you are left to experience the social, physical, environmental, aesthetic, architectural and intangible benefits of golf. So, if you do not do it already, I would encourage you, if it is physically possible, to enjoy the walk, for there is no other way to experience this wonderful game. If you would like to share your story about why you walk, please email it to The Walking Golfer and we will post it on the site. Also, if you have any pictures of “great walks” that you have experienced, please email them to The Walking Golfer and we will post them on the site. Photos by Rob Rigg unless noted otherwise. Thank You Rob! I stumbled upon your site just last week through the Golf Club Atlas and just absolutely love what you are doing. I get goosebumps reading your thoughts on the game and playing it the way it was meant to be played. I walk while I golf because that is the way my Father taught me to play. I thoroughly enjoy strategizing my approach while walking to my ball. I enjoy the click-clack of my clubs and I walk because I enjoy the experience “in between,” taking in the architecture, nuances, scenery and overall enjoyment of being outside doing something I love. I have to admit that the obsession with score is something I need to work on, however I will be enjoying the walk! Thanks again and keep up the good work. Great article. Sums it all up. I’ve noticed in my 45 years of golf that the walk is what makes the golf most enjoyable. I don’t ride carts at all, if I can help it. I golfed with my neighbor and his 2 buddies a couple of times last year. They all are 20 years younger than me. They ride, so of course, I had to ride, too. The guys were good company, but by 14 or so holes, the only thought in my head was “When was this going to end?” With all the zipping around the course, checking yardage and pin placement, the golf experience was lost. A full complement of clubs adds to the confusion. For me, the key to better golf is not to worry about score. If you play poorly, keep on playing and enjoy the scenery. If you play well, keep on playing and enjoy the scenery. A bad day of golf is better than a good day at work. Cheers!